LETTERS written by or to my 2nd Great-Grandfather, Richard E. Richards, who was born 2 Feb 1833 near Redditch, England in Sambourne, Coughton Parish, Diocese of Worcester, County of Warwick. He immigrated on the ship “Yorktown” to New York with the Charles Walford family on 28 May 1849; married his sweetheart, Sarah Walford, on 26 Mar 1856, in Peoria, Illinois; was naturalized 6 Nov 1860; and then enlisted in the U.S. Army in 1862. Company C, 125th IL Volunteer Infantry. Enlisted 14 Aug 1862; Date of muster: 3 Sep 1862; Wounded 27 Jun 1864 at Kenesaw Mountain, Georgia; Discharged 18 Mar 1865 as Sergeant. At the Battle of Kennesaw Mountain, he was wounded in the left knee and right heel from the same bullet. Due to poor medical care, gangrene set in requiring five operations, from which he nearly died. He was in hospitals from Sep 1864 to March 1865, when he was discharged and sent home. Kenesaw Mountain, where he was wounded, is 25 miles northwest of Atlanta, Georgia, and is famous as the scene of the Civil War battle between the Union troops under Sherman and the Confederate troops under Johnston, which took place in June 1864 and resulted in the repulse of Sherman with a loss of 3,000 men. He was also at the battles of Perryville, Chickamauga, Missionary Ridge, and Resaca. Richard was discharged from the Army in Chicago, 18 Mar 1865, and returned to his home in Peoria on crutches. Being medically discharged, he received a pension of $5 per month for the rest of his life, and suffered from oozing wounds until his death in 1898. Copies of some of the following letters were given to me by my Aunt Anne many years ago, while others were provided to me in Nov 2008 by Howard Boswell, a descendant of Richard E. Richards through his daughter Mary, who was a sister of my great-grandmother Fannie (Richards) Tennant. I posted a few of these previously, but after receiving several more and finally getting them transcribed, I wanted to post them in the order they were written. Most were previously transcribed either by Howard or Anne, and the few that weren’t — 3 or 4, if I remember correctly — I transcribed myself. None of the previously typed transcriptions were in digital form, so after scanning those with optical character recognition, I only had to make a few corrections. Some words are missing or guessed at for various reasons: sometimes the copies are too faint to read; sometimes there were folds, holes or tears in the originals; and sometimes poor alignment by the original copier left words or entire sentences cut off. If anyone has access to copies of the original handwritten letters and can provide missing words or make corrections, please do so. If you don’t have access to copies, but would like them, please contact me. Keep in mind, though, that my copies are probably copies of copies and one can just about go blind trying to read some of them — although once scanned, I did my best to digitally enhance them so they were easier to read. In the following transcriptions, I’ve corrected spelling or added complete words where he used abbreviations in some instances and changed “&” to “and.” His letters are a joy to read. I’m told there were about 60 in all. I wish we had the rest! If anyone still has the originals, I’d love to have the opportunity to scan them. Even if they are so brittle they fall apart once opened, I believe it better to have what we can of them than to preserve them unopened and have their contents lost to us forever. I dropped you a line some 3 weeks ago from Louisville, since which time we have been marching, driving Bragg’s forces before us. On the 8th he made a stand near Perryville and gave us a pretty hard fight, the acct. of which you have probably rec’d ere this. The Battle line was about 17 miles long. We were on the right wing where the firing commenced about 3 o’clock in the morning. Our Reg. was about a 1/4 of a mile off when the pickets opened fire. About day light they planted their Batteries and we were put to support the 2nd Ill, after canonading for a while, firing on our end for the present ceased and on the left wing (where the heaviest of the fighting was done) they opened in good earnest and cannon and musketry roared unceasingly until probably 4 o’clock P.M. when the Rebels made a most desperate attempt to break through over our right wing, and such cracking of musket and Roar of Cannon you never heard, and of which you can have but little idea. This lasted about an hour when the Rebels retreated, much to their disappointment, for they believed (as we ascertained from Prisoners that there were only a few raw troops placed there and would run as soon as a good volly was fired into them). Our Reg. was all this time laying on our faces waiting for orders to rise and fire, which however did not come ’til just before the retreat and we had not the satisfaction of firing a gun upon them, but only seeing them run and our shell follow them ’til they were out of sight. 8 in our Reg. were wounded, 1 killed and from the way the Bullets whistled round our heads, it would seem that half of us must have been killed had we been on our feet. Lt. Col. Magie of the 86 Ill. had his Horse shot. Kleffman had his Arm broke. Alf McKinny of Kingsy was wounded in the leg and 1 of the Grahams was wounded. I have not ascertained exactly how many on either side were lost, but I suppose the loss on both sides, Killed and wounded, could not be less than 5,000. I was over a part of the Battlefield on Friday (the Battle was Wednesday) The dead had commenced to smell offensive and looked bad. It is a hard sight. You may be sure I had enough without going very far over the field. The rebels are not uniformed except with clothes taken from our men. Our men have buried all of the Rebels Killed at Perryville – 2,070 there are. I understand 1700 of our men lay wounded at the hospital and 1600 of the Rebels left besides what they carried off. 700 of our men I understand are killed. This is as near as I can tell but it may not be correct by a good deal. We know but very little here not 1/2 so much as we did at home. I should be glad to hear from you and I wish you would tell me how things are going and what you think of matters and things. We know little further than just our own Division. There have been a great many Prisoners taken and Rebels (lay?) closed in our line of March the last 2 weeks. Oct 23rd since I wrote the above. We have again been marching hard. Where we are going to we cannot tell. They keep us in total darkness. We don’t know an hour ahead what is before us. Today we have not moved any as yet and it is tolerably late. I think it probable we shall stay here tonight on a hill in the woods. We were raised at 4 o’clock this morning and ordered to get ready to March at 6, and after standing a while with our knapsacks on were told we should not leave ’til further orders. The thing is not managed right. It looks to me like running mens legs off and in fact killing our own men for nothing. Our baggage weighs 50 or 60 lbs and they sometimes drive us 20 miles a day. Last night I was the worst tired I ever felt I think, but today I feel pretty well. My general health is good and my appetite good. My feet get very sore marching. The roads in Ky are very hard, made out of broken stones like those in England, that is the turnpikes, and it is on them we generally travel. We think we are going back to Louisville, Ky. or Nashville, Tenn. We have come back about 60 miles (in the direction of another fortress?) I hoped to get some rest after a while. I wish you would write me soon and tell me all about what is going on there. Such rumors here. (Truth bad, and news?) that has kept us in commotion all the time and truth in them. The chief rumor of late is that there is an extra session of congress and they are trying to make peace. It may be so. I hope it is, but I dare not believe it. We get plenty to eat and I get along with the pain and fatigue pretty well. I live in hope to get home by spring. Kind love to all. Hoping to hear from you, my dear bro. I must write to Sarah and it is late. Excuse haste and errors. Save your newspaper. Short on paper, he wrote this letter in two directions, first filling both sides and then turning the pages sideways and writing over what he had previously written in the letter. 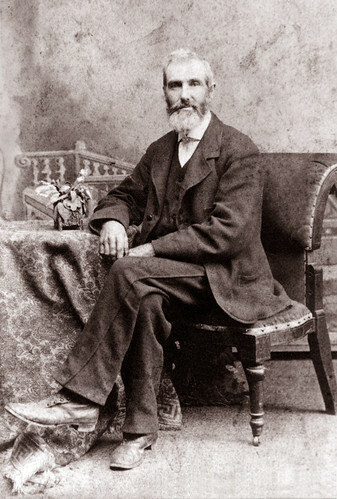 The “Danville folks” refer to his mother’s sister, Jane (Steward) and her husband Henry Smith in Danville, Vermilion, Illinois (not Danville, Virginia). “W. S.” is William Smith, their son (his cousin), in Company A of the 125th Illinois. Your welcome epistle of the 18th Ult came to hand day before yesterday. I was feeling Anxious about you. W.S. had a letter a few days back but there was not a word about you in it. Aunt thinks it strange Richard does not write. I fancy R’d will not trouble the Danville folks much with correspondence or otherwise hereafter. I do not nor do I expect to feel right towards them. Wm. and I are not very sociable. I do not run after him much and it is very seldom he comes in to see me. It is quite a relief in my mind to know that you are at home safely and as well as you are. Try my dear girl to Keep up your spirits and feel happy and your bodily health will be better. I don’t intend for mental depression to wear out my physical strength. Of course I do sometimes feel a little lonesome but I endeavor to look more at the bright than the dark side and keep up a lively hope for happier days to come. My health has been good ever since I left and I never expect to have as hard marching again if we are out 3 years. The weather has generally favored us, but we have had some pretty hard weather too. Yesterday our Reg’t was out on Picket. There was some little shed places just up against the fence but the Reg’t we relieved were accompanied with Body lice and being affraid to sleep in the little quarters, the most of us slept out in the open air thinking we had rather encounter rain and cold than sleep in the lousy old nest of others. It Rained through the night considerably, but my good old oil cloth kept Wolf and I dry. We slept beneath it with my Cartridge Box for a Pillow while the storm pelted the outside of our Bed. We slept comfortably whenever we got a chance. We stand guard you know by turns. Sometimes we have to stand on our Post nearly all night. I don’t think that we shall leave here at present. We are about 70 miles South of Nashville. Did you get the $2.50 from Gilman, the balance of money coming to you at Danville? How much money have you left? I don’t expect to get any money ’til about the 1st of Jan. I don’t need anything particular except Paper and Stamps. Those are hard to get. I have not suffered yet for want of food. We do not get quite as good Rations as we did awhile back but I shall be well satisfied if we never get worse. I got a letter from N.Y. a while back and am sorry to hear that Mrs. R is still a cripple. She tells me she wrote 2 letters to you and rec’d no answer. Did you get the letters at Trivoli? I wrote to Tom and Father from Bowling Green. I have written to Chas. twice and to you about every 2 weeks. Did you get the 1 with a piece of stuff in and directed on an enclosed Envelope to Trivoli? I have 6 of your letters and have I know lost some but I think there was one or two letters miscarried. My last letter to you was written two weeks ago last unday. Our Overcoats cost seven Dls 20 cts. Dress Cts [Illegible] 71 cts. Pants $3.03, Cap 63 cts, Socks 26 cts, Shoes 1 dollar 94 cts, Drawers 50 cts. My Bill of clothing amounts to twenty-two Dollars and a half thus far. I have worn out 1 pair of Shoes and got the second. Tell Henry Binnian that Col. Gumnip has been Court Martialed on a charge of stealing silverware and sending the same home to his wife. I don’t know how he will come out. They treated you kindly at Decatur. I am grateful to them for it. I hear but little about the southern feeling in regard to Lincoln’s proclamation. I have heard Citizens say that they thought the south would be better off without their slaves. Newspapers do come by mail but they are very apt to fail. C. Magie has been quite sick with measles for some time. I have not heard from him lately. He is at Nashville. Write soon and often. Give my affectionate love to all friends. I shall be very glad to hear from any of them. This is New Year’s day, a bright pleasant sunny day. All is calm in nature but the boom of the cannon is at this moment convulsing the heart of many a poor Soldier. Yesterday and last night I was on Police Guard. A few miles South of us was a bloody and hot engagement which is still going on. We can hear the booming of the cannons. The result of yesterday’s engagement we have not yet heard. We have conflicting reports we hear this A.M. that our men have forced them from and are occupying their Rifle pits. I hope by tomorrow to hear of their occupying Murfreesboro. We are all quiet here. For the last 2 mornings we have been called out at 3 o’clock in case of an attack by a detached Body of the Enemy which it has been thought were hanging around with the calculation when our army advanced of slipping in upon and taking this place. But should they make the attempt I think they will not make much of it. I don’t apprehend they will try it. You will remember Jack Charles. He was taken prisoner by the Rebels a few days ago while out with about 200 men replaceing the Railroad. They were all captured and 110 Wagons loaded with provisions were burned. Our men captured a whole Brigade of the Rebels last Monday (I think). I should have written a few days sooner but the R.R. has again been torn up between here and Louisville and the mail has not passed either way for about a week. It is expected that the cars will go through tomorrow. I shall then look for a letter from you and will forward 1 also. Jan 2nd a.m. we have had no reliable information of the result of the Battle but it is believed that our men took Murfreesboro at the point of the bayonet yesterday morning. Time flies fast. The weeks seem to pass quickly and I hope that each succeeding one brings you a letter from me. I write about once a week, but sometimes I am almost obliged to allow it to pass a few days over the time. My last was dated 30th and the preceding one was enclosed with $5 to [illegible] and not numbered on the 21st Ult. I can’t give you much news in each, for what I tell you one week generally applies to or covers the news of the next. There is some little change in our duties. We have for 2 weeks been guarding trains to Murfeesboro but now I understand we have got to go at something else. What it will be I don’t know. We have had to do a little work on the Fortifications the last week. They have several hundred Negroes working on the different fortifications round this city. There was a little fight at Franklin day before yesterday (15 miles from here) the result of which I have not learned. It was reported here yesterday that our men took 1700 prisoners and the Rebs took from us 105 mules but this is not reliable. I am anxious to hear of the fall of Vicksburg. There has been a tremendous battle there. I should like to know the address of the [illegible] I know in the 86th. That Reg’t is here. I am glad to hear that Freddy [illegible] to school, became well and is a good boy and my dear little Eddy too. I should love to see them and hope the time is not too distant when we shall be permitted to unite and hear the sound of peace proclaimed throughout the land. We get plenty to eat I don’t think it is worthwhile sending a box. The shirts I should like very well but I can do very well without them. I have the 2 I fetched from home yet, but they are getting a little rotten. Shall have to draw some. I have drawn a blouse, light coat and a straw hat. I thought of getting my likeness taken and sending to you but they charge so high for them. I am about out of the notion. I should like to send it if it did not cost so much. The wheat between here and Murfreesboro looks bad. Won’t go over 5 or 6 bushels [illegible] the most of the land is lying idle. What little corn there is looks well. I think of nothing of importance to relate. Keep up your spirits dear Sarah. it will be better for you, for me, for all. Nothing is gained by being down-hearted. Let what may come. Let us therefore try to be happy, trust in God, and foster with great care hopefulness. Continue to give my affection to all with kisses for the little ones and believe me. This letter seems to have contained some dialog that either Richard or Sarah later decided to keep private, as some of it is blacked out. In my last to Father W I promised to give you in my next a brief sketch of our trip from Ringgold, Georgia around through East Tennessee and back to our old camp at the Ford. I have delayed writing longer than I intended partly on account of writing once to Fanny on the 24th Dec by which I thought you would hear from me, but chiefly from the inclemency of the weather and our unsettled condition, but to fulfill my promise I will fo back to the 28th of Novr we were then near Ringgold. In the morning it rained hard for some time during which we held our loads, expecting every moment to start. At length the order was given and we pushed out. The roads were very slippy and muddy. We marched back towards Chattanooga several miles and camped in the woods for the night. on the 29th we ascertained that our destination was East Tenn. and the purpose was to interrupt Longstreet. It was a very cold windy day and being poorly clad in thin summer blouses the wind seemed to cut through us. That day we had a mountain pass to go through. We bent our way towards Chattanooga. Government rations gave out and we lived off the country through which we passed. Got plenty of corn meal and meat, but had poor conveniences for cooking the former. On the afternoon of the 8th it rained hard. We got wet. The mud was [illegible] top [illegible] we had a miserable time. Marched ’til after dark and camped on the Hiawassee River. Was fortunate in getting a lot of corn blades which made us a good bed. Here we laid 6 days doing Picket duty. The weather generally pleasant, we had a slight rain on the 12th and on the 13th a hard rain on the 15th we again [illegible]. It was a pleasant day. 16th cold. We marched ’til after dark and before we reached camp it commenced raining and was a complete wet night. We had a bad time. Camped near the Gap, which we passed through on the morning of the 17th. The streams were sollen and it was difficult getting along. The roads were bad for a while. We then struck the Railroad which we followed to Chattanooga, which place we reached about 3 o’clock p.m. on the 18th. The bridge was out of repair. Several thousand men to cross the River and only one little ferry boat to carry them across. I stood around ’til I was nearly frozen, then by a little shenanigan got in with another Brigade and succeeded in getting across the river and reached camp at the Ford about sunset and slept comfortably in our old shanty; some of the boys did not get in ’til next day. We found there our blankets from Nashville. My things came all safe except a bunch of letters. One box of clothing was lost entirely. We drew some new clothing and were fixed up comfortably. We stayed there over Christmas, had no duty at all to do. Christmas night it rained hard and the next morning we marched with all our clothing. We had loads big enough for mules. The roads were very muddy and it rained all day. We reached here a little before night and found a dense thicket of pines where we are now camped. It rained the next day and has been very bad weather for us to fix up our Quarters, but we have got up a pretty comfortable shanty and more more settled. We were on Picket on New Years Day. It and the day before and the day after were exceedingly cold, blustery and uncomfortable. We did not get fixed up in our little house ’til yesterday. The medicine you sent me I lost. The bottle by some means, got broke in my knapsack and the stuff run all over my things. I don’t like liquid medicine with no better place to keep it than I have here. When I last wrote you I was in a hurry. I did not reply to yours which reached me the day we left the Ford first. In reference to (blacked out words) I have only to say that you have (blacked out words) without I think (blacked out words). I assure you I had no (blacked out words). I did not for a moment dream of (blacked out words) any (blacked out words) but (blacked out words) object to my writing (blacked out words) it is enough. I will do so no more – or not at least ’til I see you, probably never. If I have done wrong I am sorry and hope you will pardon me. The mittens you sent fit me nicely. You paid more postage on them and the medicine than was necessary. Charley Smith got a pair of heavy buckskin gloves through the mail for 6 cents while you paid 18 for my light mittens and 24 cents for the medicine. It is bed time. I will look over your letters tomorrow and if there is anything to answer I’ll answer it. For now adieu. Battles participated in by the 125th Reg. Illinois Inf. Co. C 125th Regiment Illinois Volunteer Inf. This is Sunday morning. It is a pleasant but cool day. We shall have Inspection of Arms soon. I wish it was over so I could write uninterrupted. It is a little over a week since I wrote you. We were then expecting soon to be relieved and go back to camp, but we are here yet. We have had some quite cold weather here the last week. Everything is quiet here in the neighborhood of Ringgold. I understand they skirmish a little occasionally, but from movements generally, I am induced to think that this is going to be a standpoint for some time. We shall probably be moved here and there but I think we shall not be apt to have any heavy marching to do this summer and I sincerely hope such may be the case bit I believe this summer’s campaign is going to be an active one and I look for startling news from some quarter before very long, maybe from the vicinity of the Rebel Capitol. I understand there is a scheme on foot to get this brigade into the [illegible] service but I don’t know what will turn out. I hope it will not reenlist, for I feel afraid you would not be favorable to my reenlistment and my mind is pretty well made up on this subject. $400.00 and a furlough for 30 days would be no inducement for me to bind myself for 3 years more contrary to your wishes but if I was single and the Regiment went into the Veteran service, under some circumstances I might be induced to go with them. Should the Regiment go into the service I don’t know what they will do to those who don’t enlist, whether we shall be allowed to serve out the balance of our term in the Reg’t or whether they will transfer us. Non-commissioned officers may be ordered to the ranks, but come what may, I don’t think I shall become a Veteran unless you think it wise for me to. Write as soon as this reaches you and give me your opinion and feelings in response to it. I dreamed last night that my dear little Freddy was dead. I do not generally think much of dreams but I shall be anxious to see the next letter. God grant that it may not be and I hope he is well. It’s 8 years ago today since our nuptial vows were mutually given. Our love was then young, but it was planted in sincerity and like the sturdy oak of the forest has tightened its roots as the storms of time have beat upon it. Many changes & some trials have met us as we journey along, but with all the changes time has wrought with wars and separation, it has not robbed us of our early affection for each other. We have sometimes seen the time when for a moment, when love seemed to vibrate, but it was only the effect of a little storm passing by which when passed only stimulated and encouraged the roots to again shoot downwards and tighten their hold in a firmer bed of better earth, to become more substantial and better able to stand defiantly against the storm and bid the whirlwinds howl. I feel, my dearest, the truth of the words in the old song (absence makes the heart grow fonder) such I feel it to be in our case. I fancy sometimes you love me too much, but how can I say it, were I to feel that you loved me less, my heart would be sad. Yet I feel unworthy of the unwavering affection with which I am crowned by my darling companion and sharer of each of the sorrows which lurk in my path. I love you dearest wife. No freezing wind can chill that warmth of mutual love. No dashing snow or pitting rain can drown even one spark. We are separated in body at least for a time, but I feel that we are together in spirit and enjoy a sympathy of soul which neither time nor space can deprive us of, and should we fail to meet again on this terrestrial ball, faith whispering peace, exclaims we soon shall meet in Heaven. I am in an enemy’s country exposed to pain and death, but still my soul is tranquil. I know that my stay upon the earth is but short and the summons will soon come for you, but my prayer to my Saviour is that we may meet ere the cold flood shall bear us away, but still may our hearts breathe the language of resignation and say with one of old, thy will Oh Lord, not mine be done. Your health is poor. Be careful of yourself. Keep your mind easy and should I be spared to return to my home, may God grant that I may not find there a vacant seat. I know, dear wife, you pray for me and it encourages my heart. May we meet again. I received your letter of the 11th on the 20th, with one from George. I posted one to you the same day. I suppose you have seen Edward before this time. I wrote to him in care of Mr. B. on the 18th. Give my love to him. We had a very heavy snow storm on the 22nd. It was 7 inches deep. By the night of the 24th, it had all gone and before the morning of the 25th, another had fallen, which went off yesterday and last night with a rain. It is very muddy and still threatens storms. We are all tolerably well. I feel better than I have for several days. I wish you would send me more of Ayers pills. You might send a box and try to keep me supplied with stamps. I am very near out. Paper and envelopes I can generally buy. Give all my love to all friends. Hoping you are all happy and well, with love and kisses for the little ones and yourself. I haven’t heard from C. for a long time and he promised to write punctually. My last to him was (can’t decipher date). The George he mentioned receiving a letter from may have been Sarah’s brother and Edward may have been his uncle, but I’m uncertain as to whom Mr. B. may have been. In the postscript, “C.” probably refers to Sarah’s brother Charles. Since writing you a week ago I have rec’d 2 letters from you. One on the 24th the other on the 26th. They were welcome and I feel happy to think that you are better in health and sincerely do I hope you may still continue to mend until your health is entirely restored. We have for several days been very busy fixing up and decorating our Camp with evergreens. I assure you it looks splendid and there are some novel specimens of ingenuity occasionally displayed, such as vessels driven by the wind. They sail round the pole and just above them is a man turning a crank working away like a good fellow. On another pole is a revolving swing, on another [illegible] worked by the same power. Our camp is laid out in streets of a regular width and along each we have set out 2 rows of pine trees and at the entrance in front, every street is arched over with Cedar with the letter of the Co. in the centre. One Co. has a Dog made of the same material, another has an Eagle set on the top we have the figures 125 cut out in one side of a cracker box and bright colors of red white and blue pasted over them, which show plainly in the day and at night we light up the box which shows the figures plainly at night. this will give you an idea of how we are fixed, but I am sorry to say there is a strong prospect of having to leave it very news you will not relish. neither do I, but you and I can’t help it so we must make the best of it. The 86th and 52nd have both built a meeting house, large and comfortable for warm weather. Ours has been enlarged. Religion is alive among us. About 180 have united with our Society, the 86th organized a society last evening called the association and about 35 united. Our friend Buesing is detailed to act for the time being as Chaplain, thereby relieved of the duties of a Soldier. He does pretty well, but is not generally liked. We shall probably be paid again next week. There is 4 months due. I don’t know whether we shall over 2. In answer to your question how tall I am I can say I don’t think I leave grown much the last 20 months, so I suppose I am about 5 feet 10 in. I think we were married on the 26th just 2 weeks after Chas. See if it is recorded in the Bible. I think absence increases the affections of those truly devoted to each other upon the principal that labor makes rest more sweet. I rec’d the large envelope and fool’s cap. Thank you for the pills, etc. I had 3 likenesses taken day before yesterday. 2 1 herewith send the one standing for Mother, the other one for yourself. I will send to England. The weather now is very warm. Give my love to all with kisses for little ones. As you may be pleased to hear Ma read a letter from your Pa to you, I will write a few lines and someday I trust each of you will be able to read it for yourselves, should you keep it long enough. You will then see and remember that when your Papa was far away from you, that he still loved you both very dearly. I will tell you where I was a year ago and see if you can remember Ma telling you about it. 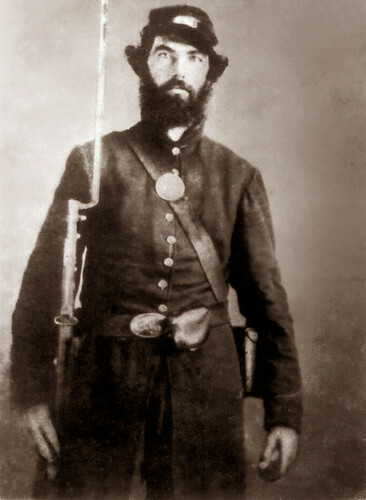 I had just got back from a long and very hard march into East Tennessee, where we had been to drive the Rebels away from Knoxville. They were surrounding the place and trying to take it and capture our brave Soldiers. The weather was cold, as you know it is in December. We had no blankets with us, and our clothing was thin. We had to sleep on the ground, which was very damp, and the snow would sometimes fall on us while we slept. It was very uncomfortable and hard, but God, who is ever good and always present preserved us from harm and brought us back. And while I was cold and shivering, and sometimes hungry, I often thought of my little boys at home and hoped they were warm and comfortable and happy. I prayed to God to bless them and me, and he did bless us and brought Pa back again, and you saw him a little while ago at home. I hope you will always love God and pray to him, and he will bless you and you will be happy while you live and happy when you die. We must always pray to God. I pray that he will still preserve our house and that he will bring Pa back to stay with his dear little Boys and Ma, and that we may be very happy. I hope you will pray too, and I trust God will hear and answer our prayers. I send with this as a token of my love, a little piece of money with which you may do what you please. The streets are so slippery and the weather so cold I can’t get out of the house. I shall perhaps be home in the Spring and I hope I shall find you not only big, but also good boys. Give strict attention to what your teacher or your Ma may tell you. Learn all you can that is good and try not to do anything wrong. Always be kind ones to the others and never get out of temper or be cross. Always be cheerful and when you have anything to do, do it well always, and as quick as you can. Never stop to think it is hard and make a great many excuses, but go right to work. That will help you do it easy. The following is a letter from Richard’s mother, Ellen (Steward) Richards, who lived at Eastern Hill in England, the farm the Richards family rented for nearly 100 years. It is postmarked 1872, from Redditch. It should be noted that Ellen was called Helen on her baptismal record, but Richard and family always referred to her as Ellen, both verbally and in writing. I am spared once more to address you and feel very anxious to hear from you, as I have written some months ago to you requesting, or rather expecting a speedy reply, but no doing. So without hearing as much as an account of America makes one feel very uncomfortable about you. I hope your poor foot or any other affliction, whether of body or mind, has not prevented it. It has been and shall remain a very irregular and unusual season. There has [sic] been very many thunderstorms, strong winds and considerable damage. A (building?) swilling cattle is out, filling house with water to the extent of great losses. I will send you an Alverton paper which will give you some better idea England at this time is in. Very confused and unsettled, with God only knows what will be the result. Talk to who you will, all seem to have some particular trouble or (threat?) to contend with your brother. Joseph remains in the town as Bailiff for his (Land log?). He has behaved very kind to him. I should say he is freer from (law?) with trouble than he has been for years. His wife has been spending a little time with us and she a very good kind of woman. C. Brown and your sister are doing very comfortably. They are all with your sister. (Polly?) has been very poorly but is getting better. She has got a very nice little home and her husband is very (under~?). I think I told you in my last all [illegible] about (Nollen?). I shall suffer very much from my (heart?) and think I shall be taken off suddenly. God’s will be done. I pray that he will prepare me for that great event as I can do nothing of Myself. Your Brother, (his?) Lucy and Myself are very happy. We have much to be thankful for though troubles often [illegible] and this is not our home for real happiness. You will see by the paper I send Your Aunt Sarah is leaving her farm. It has been sold and put to another. She is very much upset with husband but I suppose he is in a pretty good position and it is [sic] fearful times with farmers. Crops are very bad generally and labour fearful high amid Gents too. But I hope all will work together for some good. I hope to have it in my power to pay my way the short time I have to remain here. I must now, my dear R., say adieu. God bless you and yours to whom we are much in affectionate love. Hoping to hear from you soon. Kisses to the dear children. Tell them Grandma has got a pretty little boy and would love to have a game to play with them again and will. God bless you. Believe me. … that a blessed home of conscious happiness is prepared for the finally faithful in a world of changeless, ceaseless beauty where sickness and death and separation is no more felt and feared. This has been another very warm day. This morning for the first time in my life I was parboiled in steam, shut up in a small enclosure, light, all but a hole in the wall through which my head protruded, and the little vacant space left was filled up with cloths. The steam turned on in which for about 7 minutes I was enveloped ’til I felt ready to cry out enough and felt like the (pain?) extended clear through me and were all pretty well opened up but failed to loosen those functions which have so long been locked up. After dinner today, the Dr. effectually washed out the badder for the 2nd time and tomorrow he intends to do so twice. It is by no means a pleasant operation but if it will do me any good I am willing to endure it patiently. I have not taken any medicine yet but think he intends to commence doping me tomorrow. I can’t form much of an idea what they are going to do with or for me, but I think I will be able to judge something about it soon. The Dr. is a very pleasant man, practices considerable outside of this Institution. This is quite a large building, but not very well occupied. There appears to be plenty of attendants, but very few patients. I have a very pleasant Room in N.W. corner of West L., well ventilated with windows, 1 in the N. and other in West, and at this time of day between 4 and 6 o’clock p.m. the sun shines in and makes it pretty warm. I sweat pretty freely as I write. It looked quite promising for rain this morning and did sprinkle a little several times, not to amount to anything, and all passed away and the sun came out real hot. I accompanied the Dr. on his rounds this morning and held his Horse while he made his calls. They have plenty to eat here and what is good. Watermelon on dinner table for dessert all that is pleasant and nice for the outward man, but no spiritual sustenance, no church, apparently outside of my own soul, but even here where I see no familiar face and no other sympathizing voice salutes my ear, that of the blessed spirit, still speaks in soothing accents of hope and cheer to my soul. Don’t neglect your Family and private devotions, and as you approach the mercy seat remember to ask that our Father in Heaven will give to me, to you, and to us all sustaining grace for all the trials of life, and with my own uplifted prayer say goodnight. It is still oppressingly hot. I feel a little weak and languid today. I have again gone through the steam bath cooking process, the affect at present is not very invigorating. The Dr. seems to think that indications are favorable to obtaining relief, at least in a measure. The urine today has not so much of that strong, stale smell about it as it had, and then was not so much color of stains in washing out the bladder this morning and the operation was less painful today. I am getting along here all right. Had a little annoyance yesterday from a drunken fellow who wanted me to play 7-Up with him, but didn’t amount to much. The surroundings and general conversation are not very congenial to my feelings and wants, but will do the best with it I can. I look to that source from whence we may draw consolation under all the varied circumstances and conditions of life. I hardly think I shall stay here longer than 2 weeks, but of course will have to be governed by circumstances. Direct to me at Mineral Springs, Ottumwa, Ia. at P.O. We have been looking for a letter from you for some time in answer to a newspaper sent to you last Christmas as I supposedly [sent], but I fear it was mislaid at home and neglected to be posted or you failed to get it in some way. It contained the sad news of the death of our dear one, Sarah Elizabeth Coten. She was taken from us December 25th at 2 o’clock in the afternoon after a long spell of sickness. She kept (limber?) most of the time from Oct. and was (reduced?) and very low and weak for some time before she died. Henry and myself was very low at that time with grip and not able to visit her for several weeks, and was unable to attend her (service?). Her (Betsie?) is keeping house for them and is a very (steady?) Industrious girl. She is 20 years old and [illegible] get along pretty well. The Lord will take care of them I trust as he has cared for me in a foreign land so very far from my dear ones at home. To return to ourselves, we are much improved in health. Henry is never better. I am still quite poorly. I have messy troubles to contend with. I have for some time suffered very much. (Neuralgia?) of the stomach and bronchial (infections?) and I feel that I am not about [illegible] to work if I was [illegible] to do it, would go [illegible] hard work and I think you know my age last Sunday was my 77th birthday, the first one that ever came on Easter Sunday. Saturday was school election and myself with many others (were allowed the first privilege of voting?) Our ticket won this (time? )… (words cut off on copy)… having all our main streets curbed and paved, it will cost us a large amount of money. We are now building a new house on the old lot of six rooms to (let?). It is very nice. I would like to move in it and rent this one we live in. Father objects to leaving the old house. I hope your health is restored to you. Again, the last I rec’d from you was written Aug. 24th ’90. You had just returned from the Mineral Springs. I hope you found lasting relief from (mens?). It seems a great affliction that is hard to cure. Many are suffering with it here. Many have died with grip, sometimes four or five buried in one day, and the sickness has affected some the Doctors say. I must conclude. I hope this imperfect letter may find you and yours all well. We all join in love to them all. Write soon. Let me hear from (words cut off on copy). Thanks for posting the letters of R E Richards. My husband is a descendent…via his son Frederick (Freddie). It is amazing that this much time after the Civil War we are reading some of his letters. Have you heard from any other relation that has copies of any letters? It has been very interesting to read some of these letters, especially those of the early movements of the 125th Illinois. My Gr-Gr-Grandfather was a Private in Company I of the 125th until March of 1864 when he was commissioned as an Assistantt Surgeion to the 15th USCT. I love your blog. I am Michael Anthony Richards, Richard E. Richards is I guess my great great Grandfather. I found his picture in a box my grandfather Tom Richards left to me.